There are two groups of people who milk dairy goats: those who "pull" the kids at birth and bottle feed them, and those who let the does raise their kids. I'm not going to say that one method is better than the other; that's almost as bad as jumping into the horns vs. no horns debate. I try to stay neutral in both arguments. Everyone has their own way of doing things and I'm sure that their choice is the best choice for them. 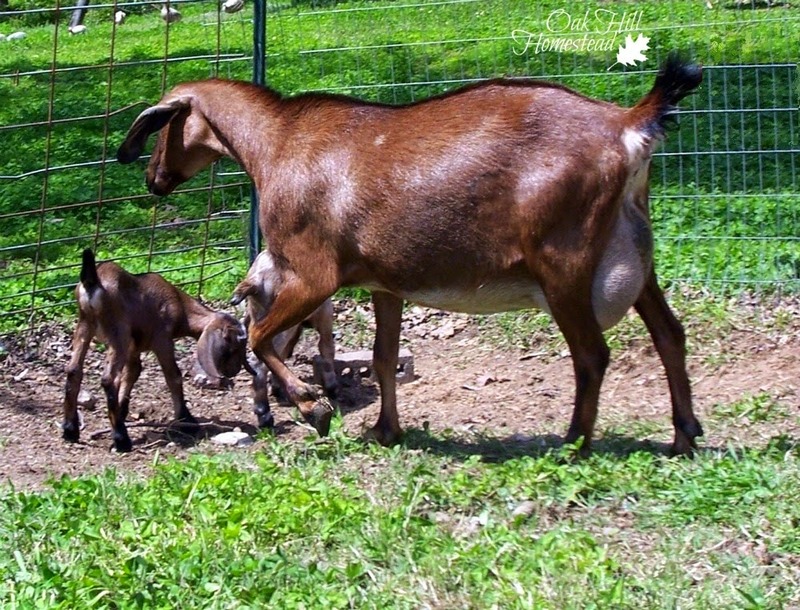 By letting my goats raise their own babies, the only milking I have to do is to keep their teats even - new kids often choose one teat to nurse from and ignore the other. This would result in an engorged teat, a very uncomfortable goat, and possible mastitis, not to mention a less-than-pretty udder. To prevent this, I check udders daily on newly-freshened goats and milk one side if needed to keep them relatively even. Usually as the kids get a little older they start nursing from both sides. When the kids are about three weeks old, I start separating them from their moms overnight so that I can milk in the morning. I don't separate a single kid unless I have no other choice; I wait until there are two or more that are old enough. Twins are easy, they have a "built-in buddy," but if I have a single kid I wait until there are others that are old enough so the kid will have company. The first few evenings can be a bit of a rodeo to catch the little ones, but eventually they realize that it's fun to have a slumber party every night where Mom can't tell them to "go to bed!" Best of all, there is a dish of grain and their own hay feeder in the kid stall. - I don't have to milk in the evening. The kids have taken care of that for me by nursing all day. I just separate them at bedtime so that I can milk the next morning. - I don't have to bottle-feed. The does produce enough milk for our use as well as to grow their babies. Even after I milk in the morning, she has "held back" enough milk for the kids to nurse, and they have a ready supply all day long. - If I have to be somewhere early in the morning, I don't have to milk. I can either leave the kids with their moms overnight or else separate them as usual, opening the gate in the morning so they are reunited. All that good milk that was stored up becomes the kids' breakfast. I usually wean the buck kids when they are between two and three months old. It's safer for the doe kids to be separated from the boys, plus buck kids can be quite hard on their dam's udder. I let the doe kids stay longer with their mothers, and continue separating them at night so I can milk in the morning. If I have a doe who only has buck kids, she needs to be milked twice daily for awhile after her boys are weaned. A doe who had a pair of buck/doe twins can continue to be milked in the morning after her boy is weaned; the doe kid is happy to have that extra milk. Usually after a few weeks I can stop the twice-daily milking of the does who had buck kids and go back to once-a-day milking. By that time our hot summer weather has usually set in and I'm happy to be milking once a day again. Thank you for this! 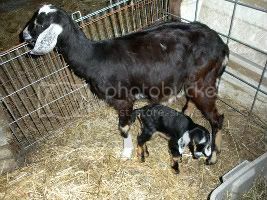 We just got our first milk goat, and we were talking about using this approach when it comes time to kid her. I'm pinning this for later! You're welcome, Abigail! Thank you for the pin! This is the approach I'll probably use, when it's (finally) my turn, too. It's also a viable approach with dairy cows. I think it also promotes good mothering, in the doe kids - as in, what they do as mamas is most likely going to be what they experienced as kids. We all learn from our parents, right? It's always nice to hear how other folks arrange their milking routine, Kathi. We do some things similar and some different, but I always let my does raise their kids. I agree with you, I don't want to be tied to a bottle baby, and besides that, I think the doe will do a better job of raising the kid to be a goat than I will. Thanks for sharing this information. Carla and Fern, I think you are both right, that a doe kid learns from her mother how to be a mother herself. My doe Phoenix, who was the first to replace my goats lost in the fire, was two weeks old when I got her. She lived in the house for several weeks until we got a companion for her. She still thinks she is NOT a goat. Aubrey, welcome! I'm so glad you're here! I love this post! So interesting and the goats are precious! The photo with the kitty is so cute too! Thank you, Kelly, I hope it was helpful. I almost didn't use that picture with the cat but decided it was "real life" around here. They're always "helping" me with whatever I'm doing. Thank you for your comment! Thank you for this information. We're hoping to be able to get goats soon and this sounds like a very doable schedule does us. You're very welcome, Rose. I'm glad it was helpful to you. Very good information! We have recently added Nigerian Dwarf goats to our farm and are really enjoying it. Reading how others do things is so helpful, and if they are doing things naturally (like you seem to be), that's even better. 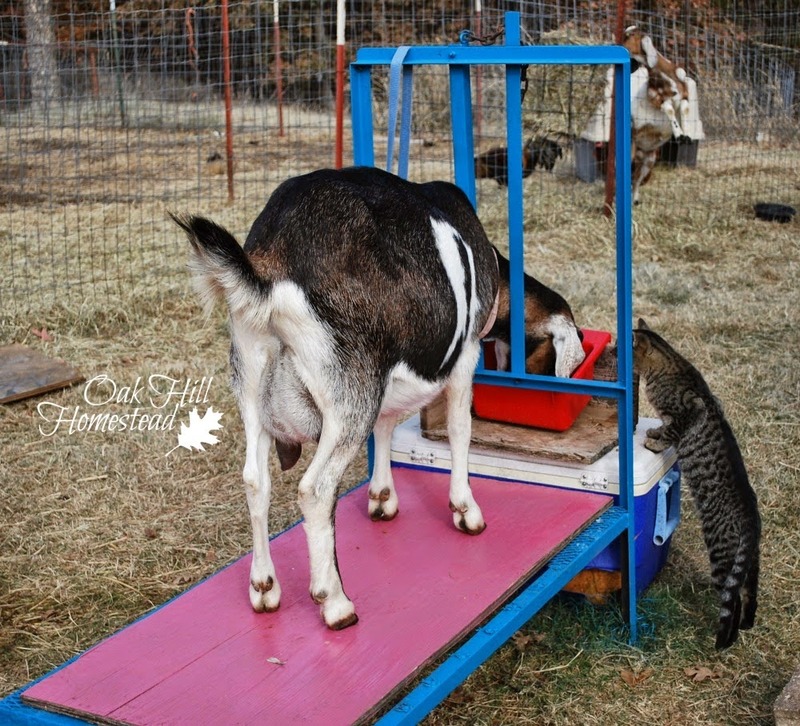 Thanks for showing us that raising goats doesn't have to be as difficult as some make it sound! Kristi, congratulations on your new goats. They can be challenging but are a lot of fun. Enjoy! Wow...very interesting! I've recently started looking into getting some goats. Thanks for the info! Thank you, Lisa. I've already been there today and done that! LOL! I agree, Terri. I've let the does wean their daughters most years too. Thank you for visiting from the other side of the world. Thank you, April! I'm so glad you enjoyed it even though you don't have goats. And thank you so much for sharing the post! Our goat has slowed down a lot in the last couple months. Like, 1 cup per milking. We aren't planning on breeding her for a few more months. Can we go to once a day milking without her drying up more? Or is it better to continue with every 12 hours? If you dry her up now you might end up with about one cup per day instead of one cup twice a day. I usually do go to once-a-day milking about this time of year, just because I'm ready for the break. If you want to keep getting that amount of milk though you'll be better off milking twice a day for awhile longer. This is a very helpful post, and I'm pinning for later! But also, oh my gosh, the pictures are so cute! Thank you, Laura. Baby goats sure have "cute" down pat! Thank you for writing this. 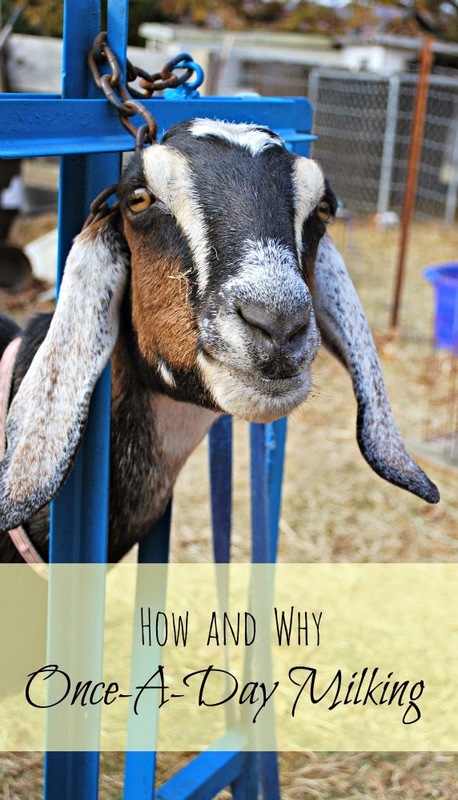 In my past, I raised goats and this brought back a lot of memories. I love goats. Sometimes they are too smart for their own good. They are wonderful animals. They are such wonderful animals. I love what you said "too smart for their own good." Very true! A friend's husband says "they have too much personality." I agree with the does raising their kids. I do the same thing. However, I separate during the day and milk in the evening. It's easier for my schedule. Hello and thank you very much for posting this article! We are under contract for purchasing land now and hope to have our home built by June of next year. We'll be bringing our pups with us and are planning on chickens, Nubian Dwarf goats and maybe even some rabbits :) I was wondering if there is a way to milk our soon-to-be goats once a day each evening just after we feed our pups instead of in the mornings? Will it work to let mom's be with their kids during the day and still get a bit of milk each evening? We only need enough for drinking and a little soap making...nothing fancy here. Thanks and looking forward to returning to your site often! Congratulations, Tracy! Yes, you can milk in the evening instead. Separate the kids from the does during the day and milk as early as you can so they'll have plenty of time to nurse before they all go to sleep.